It's Saturday night so it must be movie night! We're not quite through our Ghost House Underground movies yet and so tonight we watched Trackman, another movie from that collection. We both enjoyed it. We watched the dubbed version (it's a Russian movie) and the dubbing was surprisingly good; certainly of better quality than the previous dubbed movies we've watched. The story is quite simple: people are trapped in a closed subway or mineshaft system with different levels and tracks while trying to escape from a giant, seemingly indestructible killer who takes their eyes as they die. There's a bit of gore but not really that much. For those of you wondering, I see my family doctor on Monday and my oncologist on Tuesday to get the results of my recent tests. Hopefully the tests will show something so that we can maybe treat whatever is causing such pain in my hips and back. We're not getting a doggy right now. I guess I knew that but I didn't want to admit it because I want to have a little puppy sooooo much... but it's not the right time for a dog. It really doesn't make sense to get one and *then* to buy a house, or to get one on the spur of the moment. If we'd already moved and this opportunity came up, well, we'd get one. This evening we went to a friend's place and watched Changeling, which turned out to be a pretty good, dramatic movie. Angelina Jolie and John Malkovich were both quite good in it, as were the costumes and sets. The story is apparently based on a true story which gave it extra punch. The only complaint I had about the movie was that it felt a little long, as though they were trying to bring too much of the story into it. It runs at almost two and a half hours and could have easily cut a half hour to make a tighter, more focused, even more dramatic movie. Have I mentioned that we'd like to get a dog someday? We'd like a hypoallergenic dog in a small breed, like a Shih-tzu, Lhasa Apso, or Bichon. We'd been thinking of waiting until after the summer (when we go on a trip out to the West coast for two weeks) or until after we bought a house (if we ever get around to doing that). Anyways, apparently there was a puppy mill raid a few months ago and some of the puppies went to our local humane society. The dogs are all cleaned up and healthy now and the humane society is looking for people to adopt both puppies and adult dogs, with adoptions starting on March 6. These dogs are all small dogs, some in the breeds that we're considering. The pictures make them look so cute. And so of course I want to go out and apply to adopt a dog RIGHT NOW. But getting a dog in the next couple of weeks might not be smart.... what do you think? Do we go ahead and get a rescued puppy or dog now? It would be less expensive in the short run, but the dog might have problems later and so might be more expensive as the years go by. If we did get a dog, what would we do with it when we go West? Would anyone be willing to dog-sit for a couple of weeks in the summer? Should we just wait until the fall or later to find a puppy? If we didn't get a dog or applied and weren't chosen, I think I'll donate to the humane society as the cost to care for the dogs has been quite high. I meant to write something yesterday but I ended up asleep. I had the MRI at 5:45pm and I'd taken two Ativans so that I wouldn't twitch during the scan. I don't think I've mentioned it, but as I relax my limbs tend to twitch. They want you to lay perfectly still during scans so twitchiness is discouraged. I didn't anticipate the effect the Ativan would have on me after the scan, which was to knock me out completely. Ian was able to watch some tv shows that I don't normally watch and then he had to wake me after we went to bed to turn off my light because I'd fallen asleep with it on. And then I slept until 3pm today. So of course I haven't done all that much over the last few days. I did do a little bit of sewing and fitting yesterday. I'm starting to feel like I *want* to sew and that's a good sign. Maybe tomorrow I'll be awake early enough to get something done. Oh, how I love the Oscars! I love the dresses, the shoes, the jewelry, the red carpet, the silly questions from the interviewers, and the show. The show has been pretty good so far; they've changed the way that the different awards are presented to make use of previous winners instead of the announcer guy (who I haven't heard yet this year). The stage is very sparkly with Swarovski crystals in an arch above it and the audience is closer to the stage this year because there's no orchestra pit. This means that the presenter, Hugh Jackman, can easily talk to the members of the audience... and involve them in his skits. I must say that Hugh Jackman is doing a marvelous job as presenter! I'd had no idea that he could sing and dance but he can do those *and* he's pretty funny. Both the presenter and comedy portions of the show have actually been quite funny which is a nice change over preceding years. The women wore mainly heavily-beaded strapless or "Wilma" (one shoulder) flowy gowns. There's lots of layering and folded fabric going on as well. Penelope Cruz wore a very vintage dress that looked perfect - lots of beading, ruching, and flowy fabrics. One thing I noticed and thought was sort of odd was that many of the dresses seemed to puddle on the ground, even in the front. Of course a gown should be floor-length, and a train might puddle on the floor, but the front of the gown should just clear the floor. Ian thought the reason for the long dresses was that the stars were all wearing running shoes instead of their gorgeous shoes on the red carpet. I could believe this to be true in the the theatre, but not on the red carpet. The fact that the dresses were so embellished meant that the jewelry was minimal and understated. There were lots of small dangly diamond earrings (not so many chandelier earrings this year) and diamond cuffs. There were couple of "statement" necklaces but not so many this year; most of them appeared to be choker-style. I have to say..... I wish the strapless dress trend would end again (; it's been around before). It's very, very difficult for a woman to wear a strapless dress well, even if that woman is in perfect shape. If women aren't bulging out the sides or top, the dress is so sculptured that it's standing alone and either the woman can't breathe or the dress only properly fits when she breathes in. I don't love the Wilma style, where a strap of some kind goes over the shoulder, but it is a little better than the strapless dress. We're still working our way through the Ghost House DVD collection; tonight, we watched Last House in the Woods. People gather at an isolated house in the forest and very strange things happen. There's quite a bit of blood and gore in this movie, as well as some violence. It was ok with an interesting approach to the story but we didn't really get what was happening until the very end. Another thing I like about this collection is that it's giving us horror from all over the world which highlights the fact that horror transcends language or country-of-origin. The things that scare people seem to be universal, so it doesn't matter where it's filmed or even how long ago it was filmed. That's not to say that all horror is good or scary, of course; bad horror movies are much more prevalent than good ones, and they also can come from anywhere. Sleeping until mid-afternoon can feel very luxurious, especially if you'd planned to get up early. Normally when I sleep late I have the alarm going off every 9 minutes or until I reset it (driving my neighbour crazy, I'm sure), but today I turned the alarm off early and so the quality of my daytime sleep was so much better. If I'm going to sleep it may as well be good sleep, right? Especially since my hips were stiffer than normal today and I guess I twisted an ankle or something while I was out yesterday. I'm hobbling around like a old lady - you should see me pull myself up the stairs. Going down the stairs is quite a bit harder, though. It seems that whatever is wrong with my left hip is also sort of wrong with my right. I have pain on that side when moving the leg in the same way that I move the left one. It's not as bad, but it's definitely the same kind of pain. When I was a baby there was a problem with my hips where the ball wouldn't fit in the socket (which I guess is one or another kind of hip dysplasia) and I had to be double-diapered to help fix it. That kind of problem is a risk factor for hip problems that show up in later adulthood. It could be that whatever is wrong was going to show up someday... and that it's shown up a lot earlier because of the lack of estrogen in my body. In some ways, then, the timing of whatever's wrong with my hips is a side effect of the cancer. Stupid cancer. No one told me that there's a Project Runway Australia! Yep, there is - and all of the episodes appear to be available on YouTube. I watched the first episode tonight and it was quite funny. Their mentor is Henry Roth, who is much more direct than, say, Tim Gunn (of the original Project Runway) or Brian Bailey (of PR Canada). Henry actually told someone that things would work better if they stopped being dramatic. It's a true statement but not one you hear from most mentors on these shows! I love how talented these designers are; I wish I had a fraction of their talent. I can't design or make the clothes nearly as quickly as they can on the show... probably because they've had more practice. Still, I don't see myself getting up to their level anytime soon. I really do keep meaning to sew but I've managed to put it off all week. I even put out recycling today instead of sewing! The fact that I'd rather do a chore instead of something fun tells me that I'm deliberately avoiding the sewing room. Part of the problem is the cane and my ginormous elbow - I feel like an invalid. Sewing for oneself requires absolute honesty: to do it, a person has to totally accept their body for what it is at that moment. I got to a point where I was accepting my body just fine but since the cane and the elbow I seem to have moved away from there. I'm sure that I'll accept my body again.... and until then, I've got Project Runway (in all of its international flavours) to watch. I seem to be having a sleepy day. A normal person would get up in the morning but I managed to sleep in until 3pm. That's crazy late! And it's not like I get much done on days that I sleep that late, either... I can only guess that I need the sleep. I bought some 1950's Australian Home Journal (I didn't get this one, but I do *love* that green dress in the picture!) magazines off of eBay because they have sewing patterns in them. They arrived today and they are so much more than just sewing patterns! There are knitting patterns for awesome sweaters (called jumpers) as well as an advice column and of course there are ads. Many of the ads are centered around losing weight or looking thin with girdles. The advice in the advice column is very dated, with a strong message to love and support your husband no matter what. They're awesome reading :). The styles in these magazines are similar to their US counterparts from that era but they're a bit harder to sew. They're sort of comparable to today's Burda World of Fashion patterns, which are gorgeous and fit well but which are a little harder to sew. One of the things I love about these magazines (and the Workbaskets that I received the other day) is that they offer a peek into what life was like back then. They don't just show what formal dress was like which, when it comes to actual clothes, is mostly what we know for pre-1850 women; the common woman's clothes just didn't last that long, and the clothes that museums do have tend to be formal garments. The patterns and ads show what women wore and what their life was like. It's Family Day here in Ontario; it's a new holiday over here although Alberta has had one for a couple of decades. I suppose this holiday has two purposes: first, to give people a break in winter, and second, to, umm, encourage people to spend more time with their families. Not that there's much else to do on a holiday here. In Ontario, stores are closed on designated holidays. Sure, some - like your corner store or a drugstore or a tourist attraction - can stay open, but grocery stores and malls that aren't tourist attractions have to shut down. It's very old school. The movie is very good. It's not quite the same as the book, with an additional character and some slightly different timelines, but the story is interesting and compelling. The 3D aspect just made the movie feel more real; there weren't any gratuitous 3D shots to speak of so I didn't have to remember that I was watching a 3D movie. The scenery, action, and dialog all feel much like a fairy tale, which makes the movie appealing for everyone. We highly recommend this movie; see it in 3D if you can, but you'll still enjoy it if you can't. I stand corrected; there's a lot more tatting out there than I thought! It's a thriving art, and some of the pieces I've seen are gorgeous. I love love love the tatting my mom used to do that had some kind of symmetry but there are people out there tatting animal outlines. Pretty cool, huh? I should look into it as I do love the look of a finely tatted piece. So I saw my doctor today and my bone scan came out normal; there are no new bone mets anyplace, which is great news! There was also nothing wrong with my hip although they saw some arthritis in my lower back. My doctor checked my hip and I only have about 5-10 degrees of rotation to either side. That's not that much. I think my doctor suspects osteoarthritis in the hip. I'm not sure what the treatment would be for this as a lot of the reading I've done kind of describes it as a chronic pain thing. For Valentine's Day, We watched My Bloody Valentine 3D . We figured that watching this movie was the right way for us to celebrate this romantic holiday :). We thought the movie was pretty good both as a horror movie and as a 3D movie. It's got some story and a little plot along with suspense and gore. If you like all of this, you'll probably like this movie. 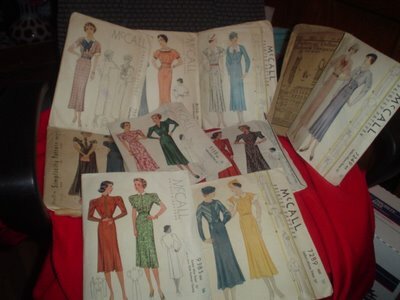 A little while ago, someone emailed me and asked if I wanted some size 16 vintage McCall's patterns. You might know that I have a vintage pattern obsession, and that I especially love McCall's vintage patterns, so of course I said that I'd love to have them. The person suggested what I thought was a fair price, sent me an invoice via PayPal, and once I'd paid that invoice, mailed me the patterns. PayPal offers protection if for some reason the items weren't as described so I wasn't nervous about buying the patterns this way. Aren't they awesome? There's a 1920's Butterick pattern, a 1930's Simplicity pattern, and the rest are all 1930's McCall's patterns. The pattern pieces are used but appear to be in great shape and the envelopes themselves are in excellent shape. The designs themselves would still look beautiful today even though they're more than 70 years old. I'm so in love with them!!! I'm going to need more vintage pattern storage. I'd forgotten how tired I got after I had Pamidronate! I had my meditation class and then a haircut and when I got home, I slept all afternoon. I'm still tired and am looking forward to sleeping again tonight. Thank goodness I have nothing that I have to do tomorrow - I'm looking forward to sitting around and relaxing. I found myself feeling more emotional today than I'd expected. This day last year was very emotional, because it was clear that my dad was really not doing well and that he was dying. I expect that it hit me pretty hard because I am so tired from the Pamidronate. I'm finally back on Pamidronate again; you might remember that I'd gone off of it while we figured out what was going on with my teeth. We now know that my teeth are fine - the problem was that the root of the tooth rested against the floor of the sinus cavity and I had a chronic sinus infection. So the sinus was inflamed and made the tooth hurt, and when the tooth was re-filled my face hurt. Antibiotics and a new filling that didn't extend as far out of the tooth took care of those problems. I was lucky and thrilled to end up with such an awesome outcome. I could have ended up with a root canal or tooth extraction, and it was in anticipation of those possible outcomes that I went off the Pamidronate. Now that the tooth problem is all wrapped up I can go back on the Pamidronate - yay! It is part of my treatment, after all. I was pretty stressed this afternoon before I received the Pamidronate - more so than I expected or would normally have been. My nurse was running super-late and I was nervous because the last time I was there, I ended up waiting forever because of a mis-communication between the front desk and the nurse. I asked the front desk twice (15- and 30-minutes after my scheduled appointment time) to check with the nurse, explaining that I was worried that the Pamidronate wouldn't happen on schedule and that it would interfere with their schedules. That's happened before as well. Now, all of that is really no big deal but I found myself almost in tears because of all this; my eyes got all puffy and I was starting to shake. I ended up doing some breathing exercises and meditation so that I didn't freak out by crying or getting mad at anyone, and it worked. Even though I talked to the front desk twice (and explained to the nurse about why I'd done that), I didn't get mad or angry or say nasty things. I was quite proud of myself for using my meditation techniques to calm myself down and behave. I'm pretty sure I was stressed because of these anniversary dates. This time last year is blurry; all I remember were trips to and from the hospital to see my dad. I know that we'd been called to come in on the Tuesday morning because my dad had another heart attack early that morning. My one sister and her family drove up from where they were living and she and I spent Tuesday night sleeping in the hospital, waking up every few hours to go and see him. I don't remember each visit - I just remember being scared. Of course I took my cane to do the shopping; I take it everywhere now. The best thing about the cane is that it's so much easier to walk with it - I had no idea that I was in as much pain as I was and that I was struggling so much. My hip and leg hurt so much less when I use the cane that there's no way I wouldn't use it now. It just feels so much better to walk with it. Using the cane is starting to feel natural and I'm feeling less self-conscious with it as well. Thank you all for your emails and support about my cane - I really appreciate it. It's good to know that I'm not the only younger (well, young-looking in my case) person to use a cane. And that using a cane isn't that weird or anything. The temperature was above freezing all day and the snow is melting! There's a brisk wind, too, which is helping the snow melt all the faster. It is such a relief to finally have some warmth out there and to see the ground. So did I spend time outside today? Well, no. I sewed, a bit. I'm still working on that pattern, and the changes I made for the back are perfect. However, the front needs a few adjustments and I gave up before I could finish them. I'm very pleased with what I've done so far, but I want this to fit perfectly. While I was sewing, of course I was remembering my dad... last year on the Saturday we visited him. He was awake and I think his breathing tube had come out or was just about to but he couldn't really talk so he write notes to us. They'd put some sort of pump-sleeve thing on his legs to help the circulation there and he wrote that it felt like the cat was kneading his legs. Well, he wrote the cat's name and my mom figured out what he meant. I told my dad that I loved him and we left. I remember leaving that visit feeling so happy because my dad was doing ok - he had come through the surgery just fine and even though he'd had a heart attack, he seemed to be fine. Later that night everything changed. He went from being the sweet, docile patient (who might have flirted with the nurses a bit) to a monster. He threatened to kill them and told him that he had a gun. They ended up putting the breathing tube back in and when we came back, he was sleeping. That morning was the last time that he was awake and could communicate with us. It's hard to sew when I'm crying but it's important to me to really remember what happened. Even though the memories are painful, confronting them head-on is easier than avoiding them (at least for long) and writing them out is cathartic for me. Apparently this troupe played in a small town in Ontarioand bombed there. People left during intermission and many were offended by the condom song. The group that brought them in had to publish an apology [this is a google cache link as the actual link should be here but is broken right now] for having brought them to the town's playhouse. This troupe's humour is clearly not for everyone but they're still ok.
We started on this diagnostic path by giving me a bone scan today. They took extra shots of my sternum (of course), my lower back, and my left hip. Hopefully they'll get some information from that. I know that I'll be having an MRI at some point and I might get as CT scan of the left hip, too. But the bone scan is a start. I saw the physiotherapist today and she recommended that I not over-exert my hip or back. So no curling for sure, and no going to the gym. She suggested that I use a cane for walking (I am allowed to walk, preferably inside with a smooth floor) so as to not put too much strain on my hip. A cane. I'm almost 40 and I have my first cane. Yippee? She also said that the cane doesn't help with balance, only support, and if my leg gives out again that I should get a walker. I don't think I'm ready for a walker, you know? Although the prospect of using it to push my way around does have a certain appeal. Still, I feel too young for a walker. Through all of this, I'm flooded with memories of what happened last year. At some point in the future, I'll remember my dad's death by the actual dates, but this year I'm remembering it by the days of the week. So a year ago yesterday, Ian and I were trying to fly to Edmonton but were grounded for the night because of a terrible snowstorm. We ended up sharing a cab and driving all over the place to get home... when we got there, we found out that the tickets that had been issued had been issued for the Friday instead of the Thursday. I crumpled into a ball of tears while Ian got that sorted out. We made it out to Edmonton a year ago today and went to my parent's place. In preparation for the surgery, my dad had to clean out his system so we went out and watched a movie. I don't even remember which one it was. We had ice cream, too, before going back. Then we spent the evening with my mom and dad, chit-chatting. I still cry when these memories come to the surface. It's part of the grieving process - in some ways it's harder to re-live something than to live through it the first time. The first time something like this happens, you don't really know how something is going to turn out. But when you remember it, you know how it ended. Talking to my dad the night before surgery is a hard memory because I didn't know that this would be the last evening we spent hanging out. I miss my daddy so much. Friends of ours have a Superbowl party each year; they make chili and open up their home to people to watch the game. We weren't sure that they would have anyone over this year because she had a beautiful baby boy within the last week, but they ended up having a small group of people (including us) join them tonight. Since there were fewer people there than last year, I was able to really watch the game this year. I enjoyed that. I don't watch much football and I barely understand the rules but the Superbowl is more than just a football game. It's an industry unto itself, really. Don't get me wrong; at the center of the Superbowl is a football game. This year the Pittsburgh Steelers won 27-23 over the Arizona Cardinals in a game that was most interesting in the final quarter. This year's game was marked by a number of turning events, like the touchdown that didn't count, the 100-yard touchdown, the safety, and the tippy-toe touchdown. There were a LOT of penalties on both sides which had a huge effect on the game as well. But football isn't the only part of the Superbowl game. There's the halftime show as well. After the wardrobe malfunction in 2004, the shows have tended to be pretty tame. This year, Bruce Springsteen & the E Street Band were the halftime show. Springsteen is a good choice for the Superbowl: his music is non-offensive to almost everyone (even if it doesn't exactly appeal to everyone) and most people are familiar with his songs. His show was pretty good. There were a few technical glitches and odd behaviours which made us laugh, like the roadie dropping the guitar, Springsteen sliding crotch-first into a camera (I think he meant to stop first), and a thing he did with the mike ... in a similar position as when he slid into the camera. Oh yeah, and the music was pretty good. All in all, the game and entertainment were ok. I more enjoyed spending time with my friends - especially my friend who had the baby and her kids. I know that I've had emotional problems around some babies in this past but that isn't a problem with this baby (or his brothers). This baby is adorable! He's still a big sack of baby but he seems to have a bit of a personality; word is that he might be quite a talker.